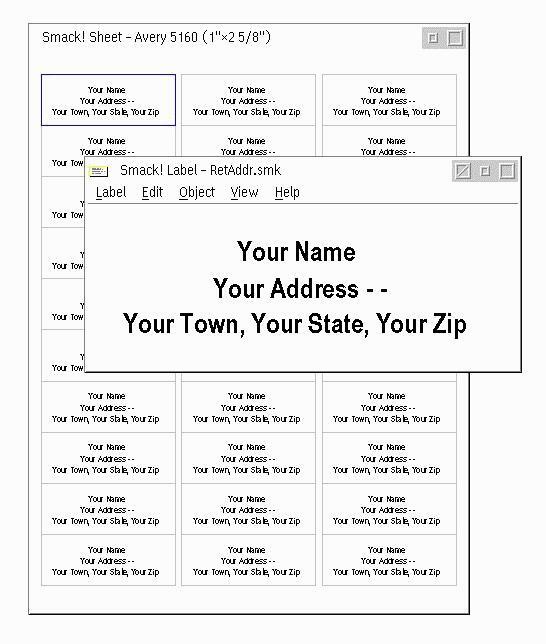 There is only one way to make address labels, business cards and even envelopes for your mailing list that is easier than Smack!, but it costs a lot more. Nothing, not even the more expensive solution, lets you be more creative. Smack! retails at $69.95. IB has it for $54. Lotus Smart Suite for OS/2 Warp 4 costs $150 to $450, depending on your upgrade path and where you shop. Its Organizer component will let you just push print on your mailing list, assuming you have it in Organizer's Address book. Word Pro comes with three deluxe templates for making business cards. But if you can get your list into a comma separated text file, you can have your own personal label and card Heaven, Nirvanna and Valhalla with Smack! As with many better-behaved OS/2 applications, if you can run an INSTALL.EXE file, you can install it in seconds. Your most difficult moment will come when you have to tell the installation routine where you want it put. Unlike any other application I have ever seen, Smack! comes with a wonderfully written, easy to follow, efficient and useful on-disk user manual. It's short, it's charming and witty, and it walks you through a true step-by-step for everything you could want to do with the program. As a bonus, Smack! is fully conversant with REXX. You don't need to know a word of REXX to get full use of the program, but if you are capable of using OS/2's built-in REXX programming language, you can write macros to extend the program to suit yourself. The program comes with two REXX scripts that handle printing with and without merging data files. Not everyone who wants to make labels or cards will have the horsepower and the hard drive room to run Smart Suite, but Smack! will run on a 386 and needs only 1.6 MB of hard drive space. In that small package you get pre-defined layouts for every Avery label package I ever heard of, 48 of them, running from address labels to business cards, folders, name tags, disk labels -- well, surely you get the picture. 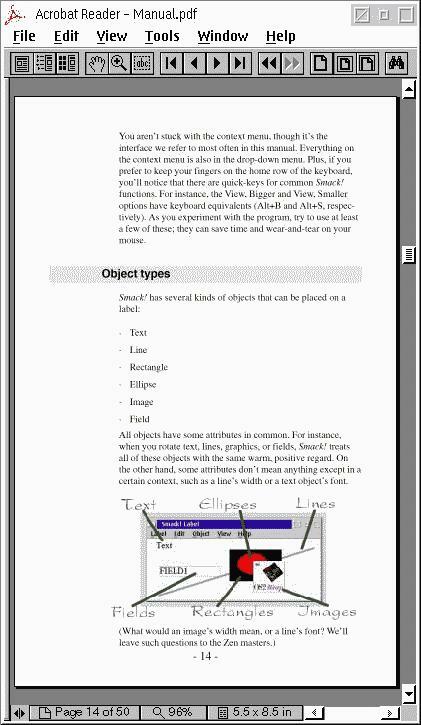 If those aren't enough for you - it lets you build customized layouts. 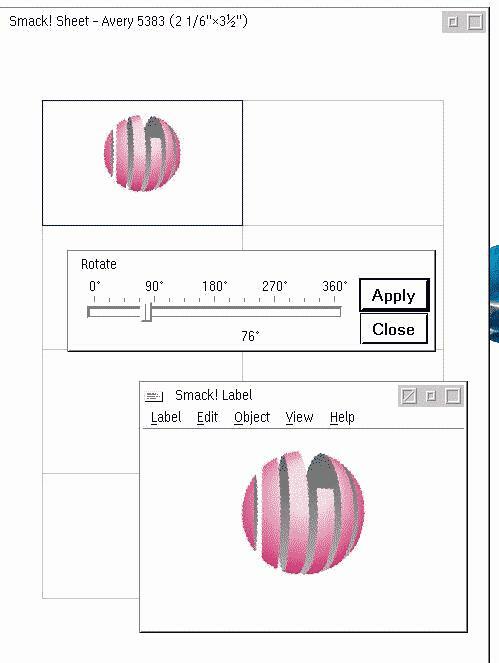 With "drag and drop" capabilities, Smack! can manipulate almost anything you can put on the compose window. Use your mouse to "draw" an area on the compose window to hold an image, and select a BMP image file in the file dialog than ensues, and then you can use drag and drop to move the image around the compose window and resize it. I found that if I tried to bring in a JPG file, Smack! would close by way of telling me it didn't like JPGs, so stick to the BMP file format specified in the manual. If you stick to the manual's instructions you can't go wrong. I think most people would learn so much from reading this delightful manual that you should consider getting the program just to read the manual, even if you never need to make a label product. All in all - a most impressive product from Perfect Niche Software - http://www.perfectniche.com/. So if you don't have a copy of SmartSuite 96 to trade in for a low cost upgrade to Lotus SmartSuite for OS/2 Warp 4, the price and functionality of Smack! makes it a very attractive alternative if all you really need is to make business cards or labels for disks, file folders, name tags, mailing lists, return addresses or anything else your imagination can conjure.